Running a successful organization is not an easy task. There are multitudes of goals to track, competitors to beat and a product line to build and protect to survive in the cut-throat race. During those times, a patent portfolio is the best weapon for an organization that can act both as a shield and sword when the need arises. A patent portfolio can serve multiple purposes – It could be used defensively to protect the product line of a company, offensively to monopolize the market and eliminate competition, and strategically to start a flow of licensing revenue for the organization. A well-planned portfolio can reap a high ROI. In another article, I’ve explained how one can increase the ROI of a portfolio. You can read the article here: How to add high ROI generating patent patents in your portfolio? But what if you have a portfolio containing thousands of patents that were obtained merely to protect your product line or be used as bargaining chips when the need arises? What if they have a potential licensing value you do not know of? What if your portfolio has key patents on emerging technologies that can get you steps ahead in the market? What if your portfolio contains some base patents that you can use against a competitor during litigation? What if someone is infringing on your patents and making millions out of it? There are so many what-ifs that if answered, could extract a high ROI on your portfolio. Is there any way to answer these questions? 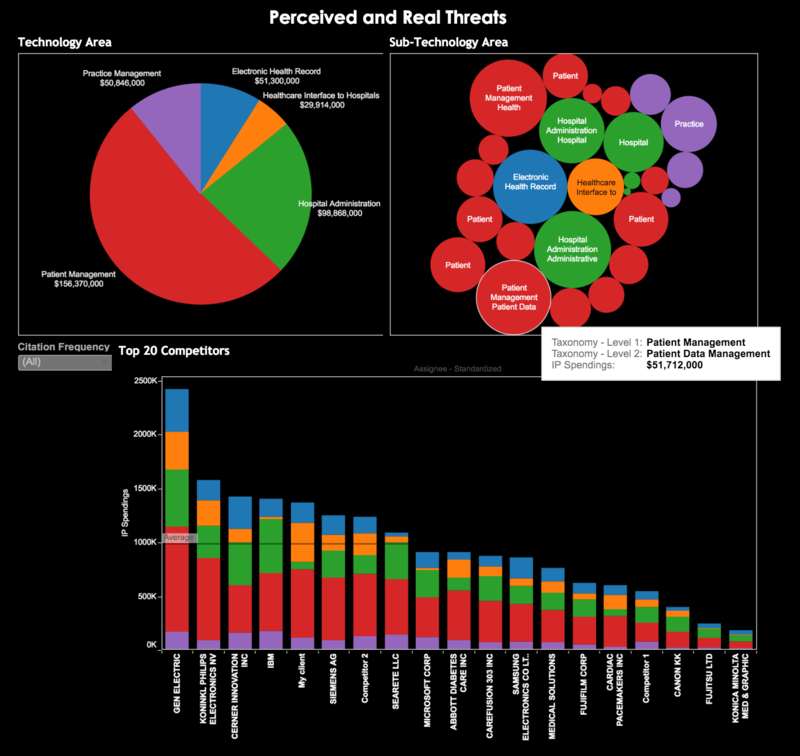 How SWOT Analysis can help extract High ROI from a Patent Portfolio? The answer to all the questions can be revealed by performing a SWOT — popular method to evaluate the strength, weakness, opportunities, and threats of a project — on your patent portfolio. During SWOT Analysis of a patent portfolio, the patents are studied and categorized into four major categories — Strength, Weakness, Opportunities, and Threats — revealing major insights related to each of the categories. SWOT Analysis is not limited to the examination of a portfolio of an organization alone; it could be conducted on portfolios of the competitors to either carry out market research or to determine threats of litigation from the competitors. Analysis can also be conducted for Countersue Risk assessment, Competitive Analysis, Merger & Acquisitions or out-licensing programs. What purpose does each of these analyses serve? — You ask. Let’s have a brief look at each of them with the help of examples. Consider the following instance where the goal is to evaluate the portfolio of an organization for due diligence prior to an M&A or tech transfer. The organization on the buying end would want to estimate the value of the portfolio prior to the deal. In such cases, strength analysis would be a great way to decide whether the deal should be made or not. For example, consider if a medical equipment manufacturer (Say EquipTech) wants to buy the patent portfolio of a company (Say Medtech) that is on the edge of ceasing operations due to funding constraints. Prior to the deal, the strength analysis revealed that the portfolio has a very high-quality ratio confirming that the company has made some solid investment on its IP. Now, the strength of Medtech’s patents gets it into a good position to demand more than the amount offered in the deal. Since the portfolio is indeed good, EquipTech has to agree to the deal as it wants to have a solid grip in the domain. EquipTech now is in a fix whether to pay the high amount asked by Medtech’s attorneys or not. One solution for EquipTech is to acquire the partial portfolio of Medtech from areas where EquipTech has lesser or no patents. But how to find the weak and strong areas for EquipTech portfolio? You guessed it right. 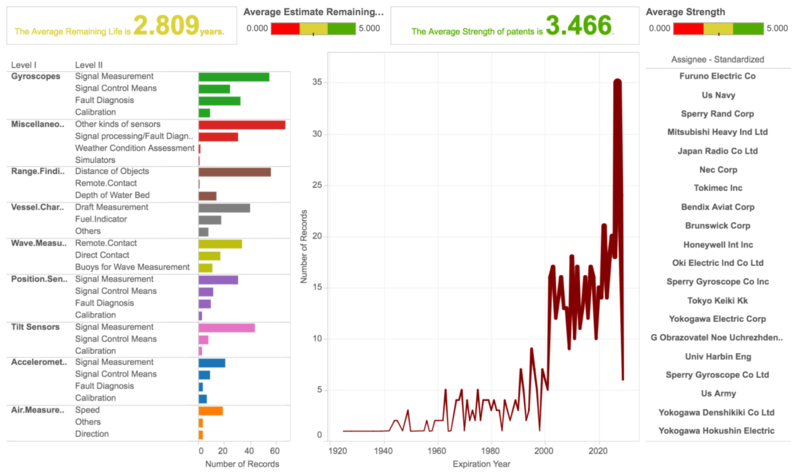 Patent portfolio analysis is a great way to demarcate the weak areas from the strong ones. Quiz time: What’s the next most important reason for patent acquisitions other than protecting inventions? Getting litigation royalties is not possible if a product does not infringe on someone’s patent. But if you have hundreds of patents being infringed by others, which is not very unusual nowadays, how do you find out which patent is under litigation against which defendant? Countersue management is the solution as all patents of a portfolio are categorized based on the number of defendants along with the list of defendants and the patents being infringed. 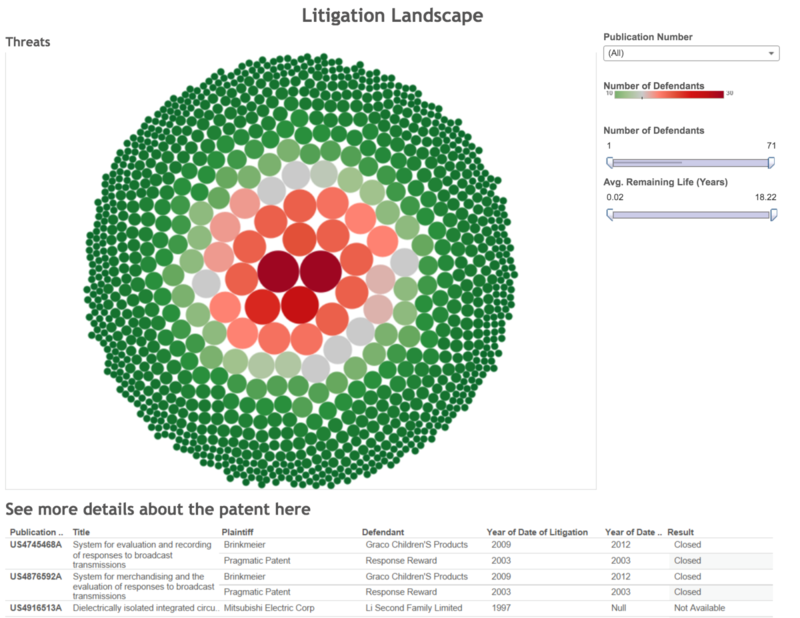 As an example, a look at the litigation landscape below can give a good idea on not only litigation data but also of the defendants in question for each patent. This is very much similar to a visual to-do list of cases to fight for the IP counsel. There is one more thing that is very important while performing a portfolio analysis. Figuring out the competitors and the amount they invested in their IP compared to your organization. Based on the information, the PRDI ratio can be calculated and it could be figured out as to how an organization fares when compared to the top competitors in the domain for each respective field. The chart below depicts the IP expenses of an organization along with the categories of domains in which it has a patent. It could be seen that the organization has spent almost half of its IP expenditure on patient management and also has a high density of patents related to patient management. For the particular domain, when compared to its competitors, the organization has a larger number of patents in the patient management system. This indicated a good R&D output ratio of the company the investment done on securing IP. If the objective is portfolio analysis for keeping a check on the PRDI ratio, the company has indeed fared well. To sum it up, a SWOT analysis can be a great tool to find out the good and bad parts of your patent portfolio. It could come to your rescue no matter what your end objective is, be it a countersue-risk assessment, due diligence prior to an M&A, self-portfolio optimization or anything else. A SWOT analysis is a multipurpose solution that would answer all your questions. Want to get one done? Get in touch. Next Step: Explore more Patent commercialization Strategies and create your own smart patent commercialization strategy using these tactics. Authored by: Anjali Chopra, Senior Business Analyst, Market Research.